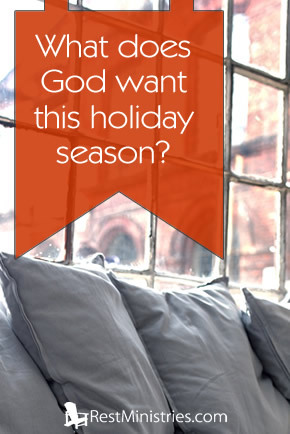 What Does God Want for This Holiday Season? Do you need to adjust what you consider the purpose of the holidays? Vicki explains. “Bring my sons from afar and my daughters from the ends of the earth-everyone who is called by My name, whom I created for My glory, whom I formed and made” (Isaiah 43:6b-7). Early October I shopped in Staples. Christmas cards were already on display. Seeing them set my mind down a familiar path . . . a path of doom and gloom. I don’t know how I’ll be able to decorate this year. How many parties will I have to miss? Ugh! I meandered through the store and spotted a pile of atlases off in a corner. That’s like me: less of a purpose. I can embrace the messages of Thanksgiving and Christmas. But the trappings magnify my limitations. Traditions become a symbol of loss: inability to bake or decorate like I used to. Those thoughts force me to confront my purpose in life. Can you relate? The holidays we dread can actually shed light on our God-given purpose. The perception of a mundane life can be exchanged for a glimpse of a magnificent purpose. It’s all about perspective–like when I look through my 3D Christmas cardboard glasses. If we view the holidays from God’s perspective, we see His love sprinkled among all the trappings. Then we realize that able-bodied and disabled people share the same magnificent purpose. ‘Put on’ your spiritual glasses as I ‘show’ you His love for each holiday. “The people I formed for myself that they may proclaim my praise” (Isaiah 43:21). “In Him we were also chosen . . . for the praise of His glory” (Ephesians 1:11a-12b). “This is how God showed His love among us: He sent His one and only Son into the world that we might live through Him” (1 John 4:9). “God is faithful, who has called you into fellowship with His Son, Jesus Christ our Lord” (1 Corinthians 1:9). Prayer: Dear Father, As the holiday season approaches, dissolve any discouragement. Keep my focus solidly on how I can celebrate Thanksgiving and Christmas. Praising You and fellowshipping with You. Oh how I want this holiday season to be all about seeing Your love and loving You. Thank You for giving me a magnificent purpose: to live my life in Your presence. In Jesus’ name, Amen. What holiday challenge do you want to see through the lens of God’s love? Filed Under: Devotionals, Finding Purpose, Holidays, Loneliness, Overwhelmed, Reflection, What's New? 9 Responses to What Does God Want for This Holiday Season? May His love far outweigh all the doom and gloom this holiday season could bring us. “May His love far outweigh all the doom and gloom this holiday season could bring us.”: Thanks for summarizing the message so simply. There may be fewer Christmas lights adorning my home, but my heart is lit up by His adoring love for me. Be blessed, dear RM friend. Thanks for that encouraging word. To God be the glory. May God richly bless you this Thanksgiving and Christmas in ways that only He can. Oh yes Vicki; I can certainly relate to the gloom and doom outlook. This year one of the trappings, decorations, could bring a little more grief. We recently got rid of a lot of stuff from our home. I was the one to go through the Christmas decorations and most of them ended up at a second hand store that is there to support a shelter for women and children. I realized after they’d all been taken away that we still have a small tree but now no ornaments for it. Just as I was typing where these treasures ended up, I realized two heartwarming things: 1) that some people would be enjoying them this Christmas, and 2) that some traumatized women and their precious, confused children will receive love, care and practical items that they desperately need. Wow! So much for being sad over my loss. Thank you Vicki, and thank You Lord for giving me this reminder. Thanks for sharing your story. It blessed my heart to read how you shifted your focus to who would receive your precious Christmas decorations. Your lesson that will help many of us: Thinking about giving TO helps ease the pain of giving AWAY. Dear Father, continue to bless Beth with more heartwarming revelations this Thanksgiving and Christmas season. One thing that has really helped me through the holidays is accepting what comes. Every year I miss a number of get-togethers because the day of the event is “not a good day”. I have truly accepted going into the holiday season that I will be able to attend few things. I have to accept that and be ok with that. I already missed my church’s Thanksgiving dinner and the Sunday service before Thanksgiving. I will be grateful for whatever I do get to attend and I will thank the Lord for His many blessings. I get up each morning and am able to function. There are so many who have it so much worse than me. Thanks for your great devotional! Thanks for your response Vicki. Your prayer for me is my prayer for you. We’ve already had our Thanksgiving here in Canada, but I love the fact that you have yours a few weeks later. It’s such a wonderful reminder of what pleases our wonderful Lord. I want to wish all my American friends here at Rest Ministries a blessed Thanksgiving. P.S. My hubby loves the football on that day! Oops! Forgot you’re a Canadian. Oh, well…happy belated Thanksgiving. My life’s been a bit busier than normal lately because my husband got his gallbladder out. He’s also a football fan. So he watched football during days of misery leading up to his surgery.